Every day, Watch This offers staff recommendations inspired by the week’s new releases or premieres. This week: The spirits are back in a remake of Poltergeist, the 1982 horror classic produced (and some say ghost-directed) by Steven Spielberg. And so we’re recommending some of our favorite “Spielberg imitations,” some involving the blockbuster maestro himself. Perhaps it’s not surprising that, by now, there would be more stereotypically Spielbergian movies made by other people than by Steven Spielberg himself. But it is notable just how few times Spielberg has actually made a movie about plucky kids in the suburbs: arguably just once, with E.T. (although some of its elements reappear, often in distorted form, in movies as diverse as Empire Of The Sun, Hook, Jurassic Park, A.I., Catch Me If You Can, and The Adventures Of Tintin). For some nostalgists, that Spielberg style is just as closely associated with Amblin productions produced by Spielberg but directed by others, like Gremlins, The Goonies, and the Back To The Future trilogy, as well as various imitators. In 2006, Amblin offered its own throwback in the form of Monster House, a horror-junior picture about three plucky kids menaced by a suburban home that comes alive and devours its neighbors. Executive-produced by both Spielberg and his protégé Robert Zemeckis, the movie came out during Zemeckis’ peak fascination with motion-capture animation—and it’s arguably the best of the motion-capture run that also included his own Polar Express and Beowulf. 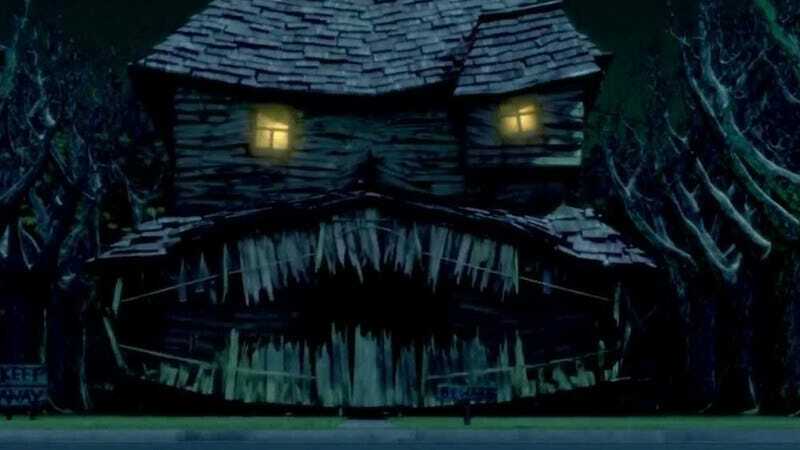 Unlike the Zemeckis films, Monster House doesn’t attempt to render its humans realistically; its motion-capture children are allowed to look slightly disproportionate and stylized (though that could also be a byproduct of their cusp-of-adolescence ages). It was still performed by real actors on a soundstage, but few of the animated characters bear much immediate resemblance to their real-life counterparts. Maggie Gyllenhaal and Jon Heder are particularly fun inhabiting different ages and bodies as a teenage babysitter and a neighborhood nerd guru, respectively. Monster House could have easily come off like an officially licensed copy of a copy. But director Gil Kenan (since recruited to direct the remake of the Spielberg-assisted Poltergeist) and screenwriters Dan Harmon, Rob Schrab, and Pamela Pettler have a knack for this material; their gloss on ’80s adventure movies feels like earnest fandom, not cynical exploitation of a formula. The movie’s central trio is composed of recognizable movie types—the earnest but slightly timid main dude, the excitable pudgy sidekick, and the go-getter girl—who nonetheless feel like real kids with real personalities. As with E.T., adults hover around the edge of the story, mostly unreliable—and like fellow updates of the Amblin sensibility Super 8 and ParaNorman, Monster House chases its kid-friendly mayhem with a vital sense of empathy. Spielberg’s suburbs evoke the childhood feeling that a whole mysterious world exists within a few square miles, and Monster House extends that feeling past ’80s nostalgia. Availability: Monster House is available on Blu-ray and DVD from Netflix, Amazon, or your local video store/library. It can also be rented or purchased from the major digital services.